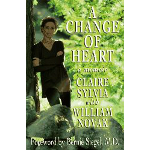 A Memoir: In Hardcover And Paperback: After a heart and lung transplant operation, dancer Claire Sylvia discovered that new organs were not the only thing she inherited. Never having liked such foods as beer and chicken nuggets, she suddenly started craving them. After an extraordinary dream, she seeks out the family of her donor -- a teenaged boy who died in a motorcycle accident -- and learns that it is indeed possible for two souls to merge in one body.